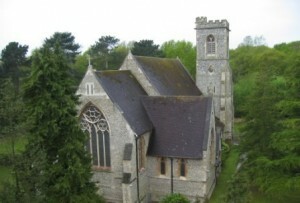 Christ Church lies to the west of Epsom town centre, on the edge of Epsom Common. We are blessed with an easy-to-ring set of eight bells, which were installed in 1992 in the existing oak frame. The tenor weighs 8½ cwt. Practice nights are on Wednesday between 8pm and 9:30pm. Sunday Service ringing is from 9:30am to 9:55am. We try to post any variations to these times on this site.